If you hurry up, we'll be in time for the train. We'll be in time for the train if you hurry up. There are plenty of others too, of course (As long as you keep walking, we'll be in time for the train) and of course -- isn't it always -- it's much more complicated than this, but there's also a cool way of doing conditionals with and and or. Don't touch the actors and they won't touch you. You could interpret that as an instruction combined with a simple statement of fact: the instruction is not to touch the actors, and the statement is a reassurance that they won't touch you, independent of the instruction. That might in fact be what is intended here, because even if you do touch the actors, they're probably still not supposed to touch the visitors. But we're funny things, humans, always looking for connections, patterns, reasons, and causes. Those two things being joined makes us want to think that there is some meaningful link between them. It's like if someone says The car is making a funny noise and Jen borrowed it yesterday. You can be pretty sure they're blaming Jen for the funny noise the car is making, and not just telling you two unrelated facts about the car. Generally, in an and sentence, both bits are the same type: both statements, for instance, in which case they must both be true (so for the sentence about the car to be true, it must be true that it's making a funny noise and that Jen borrowed it -- notice that the inferred link that Jen was to blame does not have to be true). Or they might both be instructions, in which case you're expected to obey both (at the same time or in order), as in Sit down and shut up. Our example sentence, about the actors, is a mix of an instruction and a statement. So we might be expected to obey the instruction and for the statement to be true. I don't know about you but I don't really know where I stand right now, as there is no obvious link between my obedience and objective truth. It would make so much more sense if, say, the truth of the statement was conditional on me obeying the instruction. So if I don't touch the actors (obey the instruction), then it will be true that they don't touch me. And all of a sudden, we have a conditional like the 'if'-clause type I mentioned right at the top, but with and instead. Can we do it with or, a disjunction? Well, yes we can, but it comes out as a warning or threat rather than a deal or an agreement. Don't bother the tigers, or they'll attack you. Now, we still have to obey the instruction but if we don't, then the second part will be true: a punishment, rather than a reward for our obedience. Touch my stuff, I'll beat you up. Now the instruction is an elliptical conditional. There's probably an understood 'If you' at the beginning, or else the link between the parts is the same as with and: if the first part is 'obeyed' (the person does carry out the action), then the second part is true. Language pedants get a lot of mileage out of bemoaning the loss of the subjunctive. The subjunctive is not really much of a thing in English, but we see remnants of it in set phrases like Long live the king, where the meaning expresses a hope or a wish. It's just the bare form of the verb, and it's used in hypothetical situations. We often don't use it nowadays, apart from in quite formal registers. It's not that important because we have other ways of signalling the same thing. But this is precisely where it is useful if you want to give a sick burn in the most understated way imaginable. You see, your subjunctive is used for counterfactuals: situations that are not currently true. So by using it you get to say 'I do not believe that this is true', at precisely the same time as you are saying with your actual words 'This might be true' (=if this is true). oof. "George Osborne and Tony Blair resemble the Kray brothers"
That surprising claim comes to you direct from the Dean of the University of Buckingham school of education, Barnaby Lenon. I've cut it down slightly - you might think he was perhaps referring to their perceived criminality, but no, it's their accents he is talking about. It's been a while since I've heard the term Estuary English. It's the kind of English that people speak all over the southeast of England. Jamie Oliver, for instance, speaks the Essex variety. We don't tend to hear it called that so much any more because you really only need a term for an accent when you're singling it out for some reason, for criticism for example, and lately (now that the speakers of Estuary English are the ones making the criticism) people's critical attentions have turned to what the young people are speaking, which is not Estuary English. So now who is speaking it, if not those damned teenagers? Well, Tony Blair, George Osborne, and Prince William, it seems. Yep, he who ought to be speaking the Queen's English is "lapsing" into Estuary English, according to Barnaby. It is very important when you are with non-Etonians to try to conceal that you are an Etonian. They do not want to appear to be upper-class because being upper-class these days is not a good thing. If you are in politics, for instance, you want to appear to be a man of the people. I mean, the Kray twins didn't have terribly pronounced features of Cockney but they did not sound like George Osborne. There's clips of them talking on YouTube. You can go and listen to them. They're just not the same. I would say that most Etonians and Harrovians these days go out of their way to employ an estuary accent. Those poor old Etonians and Harrovians, held back by their posh accents, disguising them to try to fit in and get on in life. Really, what's going on here is that Davis has found that prep school boys' accents have continued the trend we've been seeing for many decades of becoming less distinct from a more everyday middle class English, features of which are shared among many varieties (glottal stops for 't', for instance). Essentially, RP is no longer so distinct from the other Englishes spoken in the London area, and has been on this path for many years. Politicians and young royals no longer get so much benefit from the authority conferred by a posh accent, and gain more benefit from being relatable (perhaps - Jacob Rees-Mogg, Boris Johnson et al still play on the private-school vibe). So far so expected. Then this chap in his new job (mis-)interprets this research for a splash and uses a term that was derogatory in the 00s to spark the old 'mockney'-bashers' ire, and makes a daft claim that doesn't stand up to a moment's scrutiny. 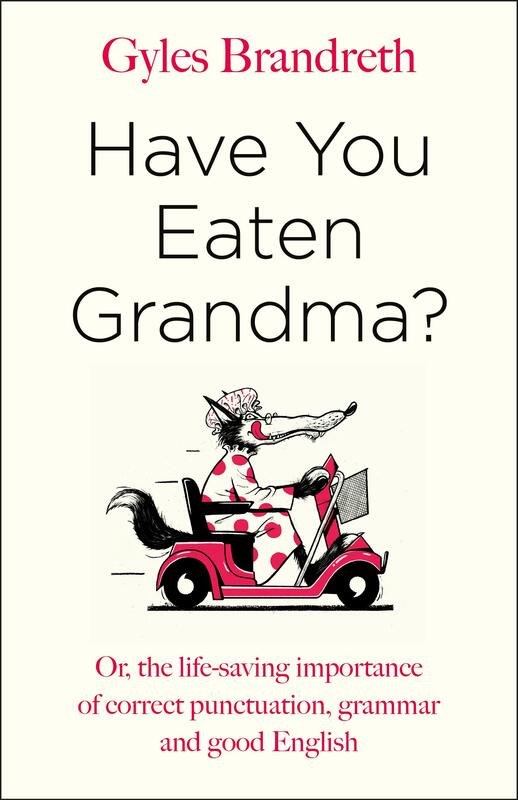 I was considering writing a review of this book, Have you eaten Grandma? by Gyles Brandreth, but to be quite honest it's not worth bothering. It's neither surprisingly good nor toe-curlingly awful. I got it for professional purposes (I'm teaching a module on 'Grammar for Everyone' this term and want to look at all sorts of books that claim to be about 'grammar') and I'll get something out of it for that, I suppose, but I'm glad I didn't buy it for pleasure. I had been ready to be cross about it after seeing this little video in which Gyles (known as being a pedant, has done truly awfully smug programmes about language in the past) talks about some of his 'bugbears' including redundant myself, can I get rather than may I get, and so on. In fact, it's exactly what you expect. The majority of it is punctuation advice. It's fine, with only a few mistakes, but Eats, Shoots and Leaves is better if that's what you want. Then there's lists of words, either just ones he likes or ones that people often get wrong in writing (accept vs except, for instance) and mnemonics (sometimes very weird ones) to help remember them. He has a bizarre joy in some -- but not all -- neologisms. He seems to have (like Stephen Fry) come around from pure prescriptivism to the joys of what he calls 'slang' some time in the 1990s, and so he loves things from then. He's constantly saying End of, for example, like at the end of the video above. He gives a long list of initialisms like WTF (which he loves) and describes some of them as being of 'the Whatsapp and Snapchat generation', which needless to say were totally unfamiliar to the teenager I asked. And yet he is so rigidly inflexible about some things that he was taught were correct, and so are immutable rules for him (you mustn't ever, ever say bored of, for example, despite the fact that there's no harm in it whatsoever and millions of people do say it). There's an embarrassing section of the abbreviations part where he talks about labels for gender and sexuality that verge on poking fun at LGBTQIA-type initialisms. He shows a clear support for non-binary, non-straight identification, but still betrays an opinion of 'simply straight' being 'normal' and 'knowing where you are'. The section on American vs British English is terrible, and relies only the books of people like him, not linguists. This is not a book that seeks to promote truth. This is very evident throughout, when he often refers to 'the Brandreth Rule' on particular points. This means that he knows that there are different ways of doing things, and his arbitrary choice is the one he likes the best. That's what this book is. It's for people aged about 50 or 60, who 'love the English language', and just want someone who agrees with them to reinforce their opinions and tell them the things they already know so that they can be smug about knowing them. I've come to realise that anyone who says they 'love the English language' doesn't really love the English language, not as it really is. They love some idealised version of it, the version they speak, the version they think is 'best', and which is being 'corrupted' by Americans, kids, foreigners, or modern education. We were in Brussels just before Christmas for a little holiday, and we visited a couple of lambic breweries while we were there. One of the brewers at Verzet was great and took the time to show us all round it and tell us loads about the process and their beers. He was talking about the background of the guys who work there, and he said at one point that one of them helped upstarting a brewery, meaning 'helped to start up' a brewery. In Flemish, there are what's called 'separable verbs'. These correspond to English verbs that have a preposition-like particle as part of it, so in this case start up. The Dutch version is opstarten. You can see that the 'up' part is a prefix, so it's literally 'upstart'. Flemish does have the option of separating that prefix from the main bit of the verb, more like the English equivalent, but it doesn't always separate (based on some rules of what kind of sentence it is). You can see that he basically just anglicised the word (it's called a 'calque' when this happens). An interesting aside: I say Dutch in the paragraph above because that's what Google Translate has, and I think that the Dutch of Flanders is not different in this respect. Where there is a difference, according to this site,* is exactly when you separate the verb. The verb remains joined together when it's the only verb in the clause, it seems. 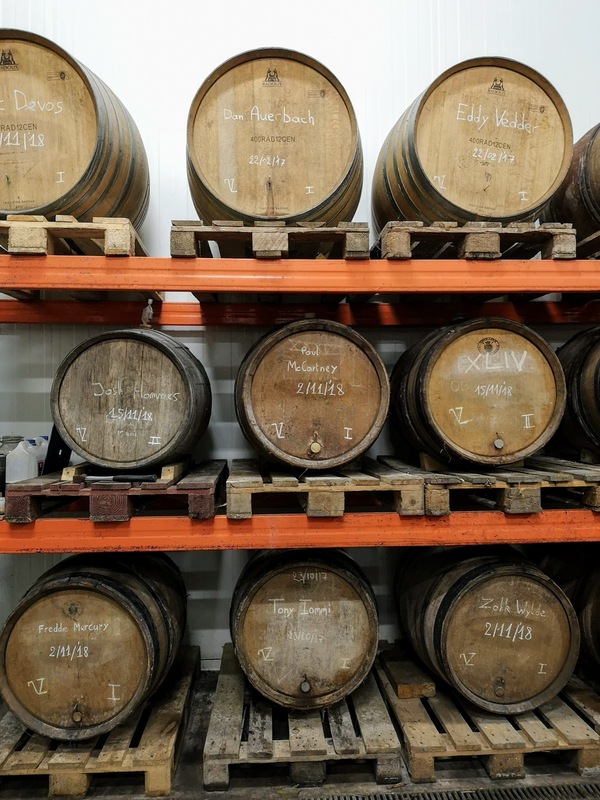 When there's another verb, as in our sentence (He helped to start up a brewery), it's more likely to be separated in the Netherlands (he helped to start a brewery up) and more likely to remain intact in Flanders (he helped to upstart a brewery). *If you, like me, like reading about grammar, this seems to be a really comprehensive grammar of Dutch that you can download as a PDF. You may have watched The Thick of It, in which Malcolm Tucker, played by Peter Capaldi, characterises someone as an 'omnishambles'. It caught on because it is an excellent word. 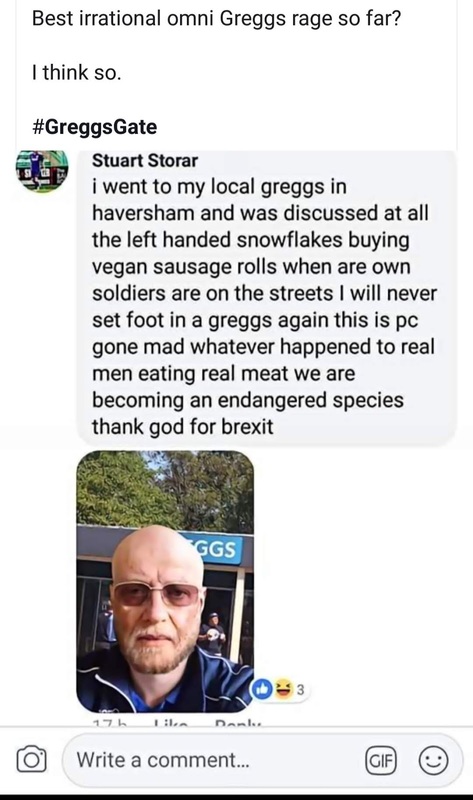 So I don't know, but I think that this use of omni in this facebook post might be an example of it going wild (the post it refers to isn't for real, but it is a convincing pastiche of a certain type of person). Omni is a prefix most of the time. It means 'every', like in omnivorous. Prefixes can cut loose from their roots if they're typically used in one specific word, or if the free version has just one meaning. So, for instance, cis means cisgender because we don't really use cis for much else (though we could - cisalpine is a word, though not a common one, meaning 'on this side of the Alps', where 'this side' means with respect to Rome - it's a Latin thing). So cis has specialised into this one meaning. Other gender- or sexuality-related prefixes have similarly gained independence, so you can describe yourself as bi, meaning bisexual, even though we have the bi- prefix in loads of words (bicycle, biped, biennial). It's just with that one meaning that it can be used solo. I checked Urban Dictionary for omni and quite frankly didn't understand most of the definitions, so I'm not totally sure what's going on here. 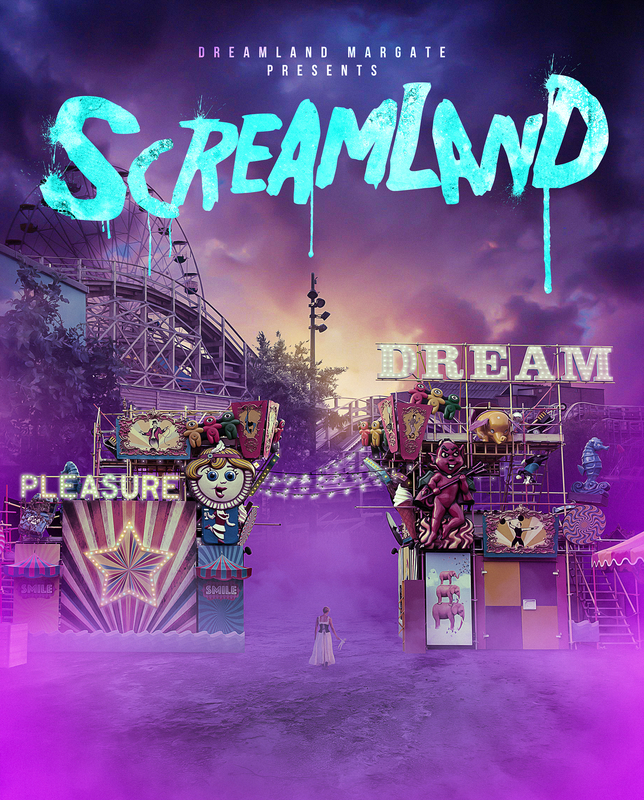 I didn't find anything that suggested it's used alone in the omnishambles sense but that really does look like what it might be. Omni rage as a term for that pure, hysterical rage as displayed by Malcolm Tucker in full flow? Family members have names, obviously, but they also have sort of pseudo-names - the kinship terms we call them like 'Mum'. I've actually always called my parents by their first names and also my maternal grandparents, who I always called Paul and Rosemary. My paternal grandparents, on the other hand, are Grandma and Grandad. Now these kinship terms are normal nouns when you're talking about them, and occur with a determiner (usually a possessive determiner, as in my mum). When you're using them as a term of address, though, they work like a name. So just as you don't say the Louise or my Jane, you just say plain Grandma when you're talking to them as opposed to about them. It turns out that I have inadequately acquired the rules about this. When I'm talking about my grandma, I'll often refer to her just as 'Grandma'. So I'll say something like Grandma sent us a Christmas card today. This apparently sounds a bit odd and I should say My grandma sent us a Christmas card today in order not to sound like she's also the grandma of the person I'm talking to. I think that because all my other relatives just have names, I treat 'Grandma' as her name and use it accordingly: compare Rosemary sent us a Christmas card today, which is totally normal. I'm Laura. I'm a linguist. I blog about it.